Berlin is bloody brilliant but sometimes you need a change of scene. I know right, you thought Berlin already had every scene covered top to toe? Trust me, nowhere else can charm you quite like Potsdam does with its cultural offerings. And cheesecake, too. Hop on a train to Potsdam Hauptbahnhof and find yourself in Brandenburg’s capital within 45 minutes. The S7 will take you there or alternatively try out a regional train for a speedier journey. A surreal serenity awaits, as the city rich in history invites you to explore its jaw dropping beauty. My best advice would be to bring your bike. If you don’t have one, worry not. There are plenty of opportunities to hire a set of two wheels on arrival. Bike rentals are well signposted from the station and you can get a rental for the day for around 11€. This leaves you free to leisurely pedal your way around the lovely litter-free streets at ease. Pick a nice day and it will be the best decision you ever make! Where to start? 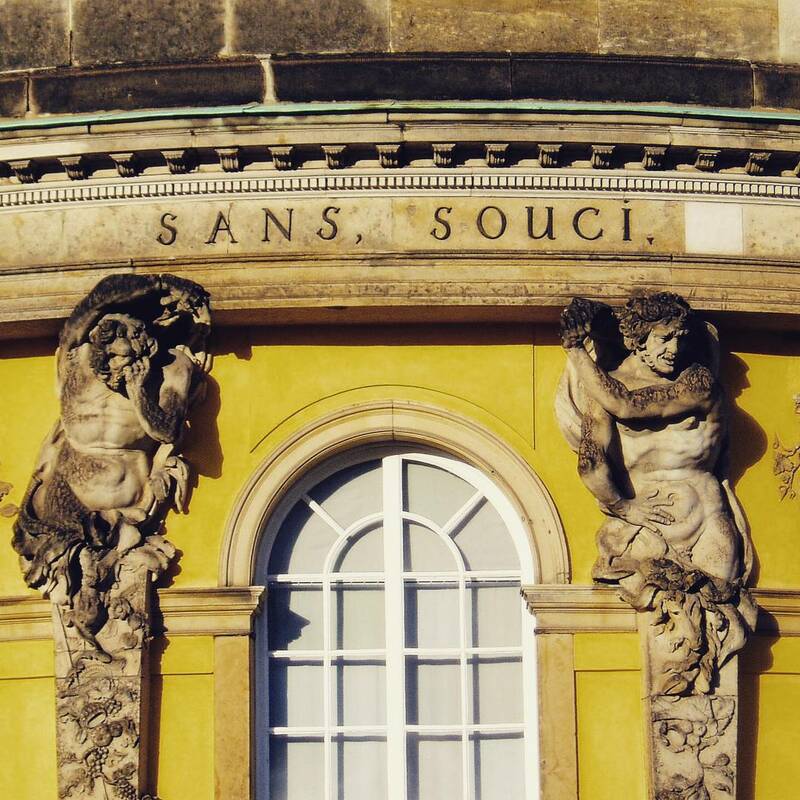 We headed straight for the largest World heritage site in Germany, the parks and palaces of Sanssouci. By bike, it’s a pleasant 10 minute journey from the main station and a chance to get a first impression of Potsdam. Following the signs, we dismounted to enter the park itself by foot. My next best piece of advice? Take your camera. And make sure you have lots of battery! We walked under a canopy of golden leaves almost cocooned inside an aisle of autumnal bliss. It is an Instagrammer’s ‘#nofilter’ heaven. All the palaces in park Sanssouci are in perfect condition as they escaped the heavy bombing that the city center endured during WWII. No matter which side you choose to enter the park from, you will find the most elaborate architecture. Whether it’s the Neues Palace or Schloss Sanssoucci that you come face to face with first, you will be gawping. I didn’t make it inside the buildings, but tours are possible in both at a small cost. The Prussian royalty especially enjoyed their summer holidays in the castle and I can understand why. The unbelievably intricate and detailed exterior is mirrored by the extravagant gardens. Explore further into the grounds and you will come across a Chinese teahouse which is equally well adorned and photo worthy. (So photo worthy in fact, that a newlywed couple were making the most of the backdrop for their wedding album.) It was a world away from Berlin. Overcome with sudden hunger pangs, the city centre called for a visit. Spot the mini Brandenburg Tor, a small Roman arch, and you have found your destination. The town has been well restored and makes for a picture perfect postcard. Wander the cobbled streets lined with cafes, shops and buskers alike. There is just the right level of hustle and bustle as you decide where you to refuel. It was a no brainer. There was only one place on our list. Heading straight for the famous Dutch quarter, we descended upon Café Guam and nabbed the last free table outside. It is a cheesecake café selling at least 10 varieties including favourites like Mohn, Nougat and Bienenstich. Need I say more? Rosy cheeked and high on sugar, we pootled back through the centre and eventually hopped on the train back to busy Berlin. Sadly, I didn’t make it to Film Park Babelsberg or the film museum but with winter coming up, they are the ideal indoor activities for rainy days! Potsdam, I’m coming back!